Farrar, Straus and Giroux, 9780374252946, 272pp. In 2011, a wave of revolution spread through the Middle East as protesters demanded an end to tyranny, corruption, and economic decay. From Egypt to Yemen, a generation of young Arabs insisted on a new ethos of common citizenship. Their bravery and idealism stirred observers around the world and led militant jihadis to worry that they had been superseded by a new and peaceful uprising. Five years later, the utopian aspirations of 2011 have darkened. In one country after another, brutal terrorists and dictators have risen to the top as old divides reemerge and deepen. Egypt has become a more repressive police state than ever before; Libya, Syria, and Yemen endure civil war; and the extremists of ISIS have spread chaos and carnage across the region and beyond it. 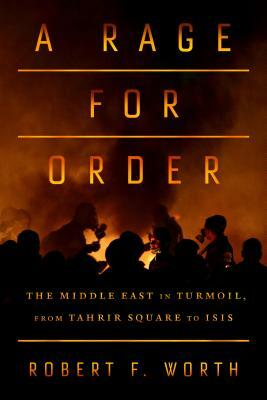 A Rage for Order tracks the tormented legacy of what was once called the Arab Spring. Writing with bold literary ambition, the distinguished New York Times correspondent Robert F. Worth introduces a riveting cast of characters. We meet a Libyan rebel who must decide whether to kill the torturer who murdered his brother; a Yemeni farmer who lives in servitude to a poetry-writing, dungeon-operating chieftain; two young Syrian women whose close friendship devolves into enmity as their sects go to war; and an Egyptian doctor who is caught between his loyalty to the Muslim Brotherhood and his hopes for a new, tolerant democracy. In a final chapter, Worth tells the moving story of the two eighty-something statesmen whose unlikely camaraderie allowed Tunisia to escape its neighbors’ worst fates.